The Halloween Party today was so much fun! Trick or Treat! 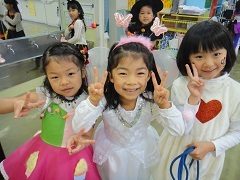 Since today was October 31st, all of the IYK children and teachers came to school in costumes! Everyone looked so cute and so cool. 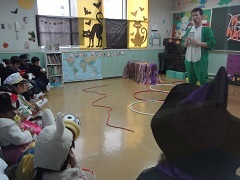 For the Halloween Party, the children went around to different game and dance rooms. In each room they helped different “monster friends” like a vampire, a werewolf, a skeleton, baby ghosts, and Frankenstein monsters. 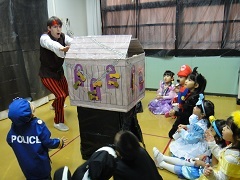 After playing games and having fun, the children could find where the character Mr. Ghost was and get candy from him. All the children seemed so happy to have fun and get candy. We all enjoyed today’s party and it was a great way to finish October!